Join Louisa county locals in Richmond for a demonstration against Dominion power and the North Anna nuclear reactors on Tuesday September 27th – a Virginia without nuclear power would be a much safer future for all of us. This demonstration is just the beginning of a struggle against nuclear power, uranium mining, and other radioactive and unhealthy corporate practices that are putting everyone in Virginia at risk. 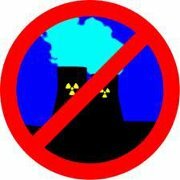 On September 27th at noon at the Dominion offices at 701 E Cary street in Richmond concerned citizens will hold a non-violent demonstration against the proposed restart of the North Anna reactors. This protest is organized by Louisa group Not On Our Fault Line but is open to everyone who is concerned abou…t the premature restart of these reactors. On Aug 23, 2011 a 5.8 scale earthquake hit with its center less than a dozen miles from the operating North Anna reactors. According to the NRC, ground acceleration at the plant was twice what it was designed to withstand.